Discussion in 'Contrails and Chemtrails' started by Mick West, Jun 13, 2014. The chemtrail theory is that the long white lines that form behind planes are some kind of toxic spraying. 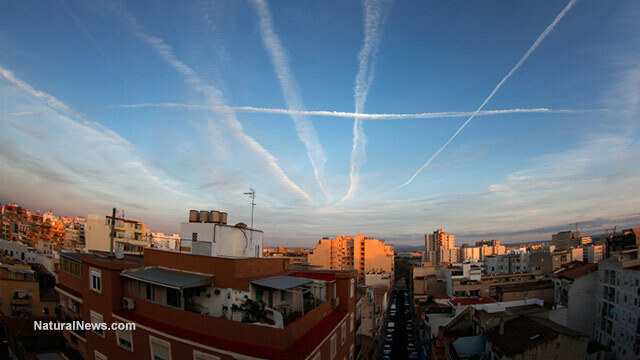 Hence the word "chemtrails" in the title, and the image of trails (normal persistent contrails). Avgas is NOT the same as jet fuel (kerosene) which is used by passenger jets, and is responsible for the contrails in the photo above. Contrails are clouds triggered by the extra water in jet exhaust. There is no connection between contrails and the lead in avgas - most simply because most planes that use avgas do not fly high enough to create contrails (except in unusual weather conditions), but also because the tiny amount of lead would not contribute to contrail formation. Look at the total levels in 1970, that's 220,000 tons per year. Now look at the levels for 1990 to 2005 - so small they had to make another graph. The level of lead emitted every year has decreased over 99%. Avgas was never a big part of this, and the reason lead was not phased out of avgas was simply cost/benefit. Avgas made up a tiny insignificant fraction of the total lead emissions back in 1970. It's only now that emissions are about 1/100th of what they were, that avgas has become a significant fraction. But it's a significant fraction of a very small number - in fact it you take it as a fraction of the 1970 total, it's just 0.25% (1/400th). So while the lead emissions are vastly smaller than they were in the 1970s, that does no mean there is no cause for concern. However the focus is on localized effects - particularly around general aviation airports, such as Santa Monica airport. SMO is just a mile from my house, and the planes practicing their takeoff and landings fly just 1,000 feet above my house every day. There is certainly some local concern about the levels of lead in the air and soil right next to the airport, and this has been studied quite extensively by the EPA. Testing on how that effects surrounding neighborhoods is relatively new. Two of the first investigations — conducted by the Southern California Air Quality Management District at the Santa Monica and Van Nuys airports in the spring of 2006 and winter of 2007 – found lead concentrations near the runways that were five to 10 times higher than the Los Angeles Basin average. In the neighborhood just east of Santa Monica Airport, concentrations continued to exceed background levels for more than half a mile downwind of the runway. 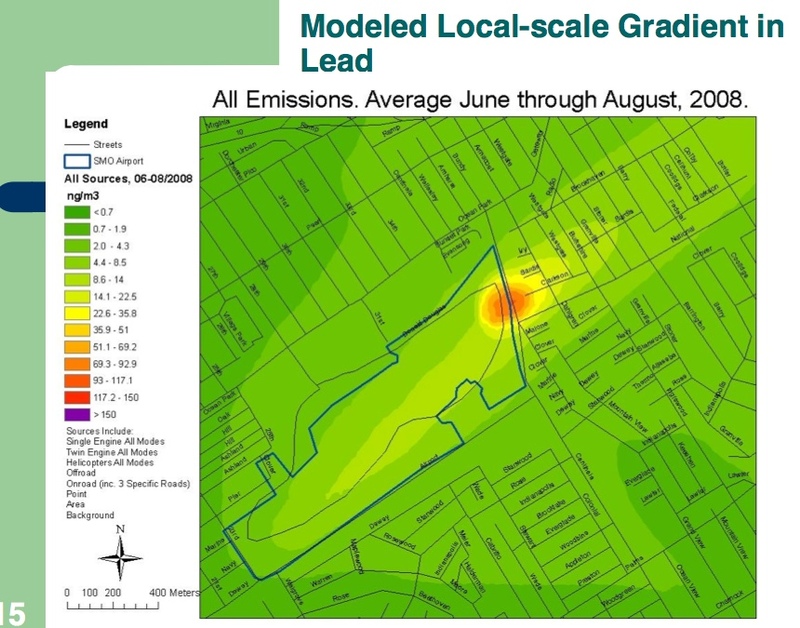 AQMD spokesman Sam Atwood noted that the pollution never rose above the national safety cutoff, 0.15 micrograms of lead per cubic meter of air. The Los Angeles basin average during the test period was 0.0086 microgram, In Van Nuys, the highest level recorded was 0.0261 and in Santa Monica, 0.096. Testifying in November at a hearing of the state Senate Select Committee on Air Quality, Hoang said a 2010 study by the EPA found similar results. Soil and dust samples taken on Santa Monica Airport property and at local parks did not show lead levels above the local norm, she said. So small increases were found, within safe levels (the cut-off is 150 nanograms/m3, purple on the scale above), and only very close to the airport. In summary, lead pollution is a real issue, but it's one that has mostly been dealt with. 99% of the emission sources are gone. Lead from avgas is a significant part of the the remaining emissions, but it's still very small compared to historical levels. High lead levels from avgas have only been detected directly adjacent to very busy small airport. The hysterical language of Adam's headline does not match the real nature of the problem. And it's nothing to do with contrails, or the "chemtrail" theory. These planes generally don't leave visible trails. THIS story is about AvGas. 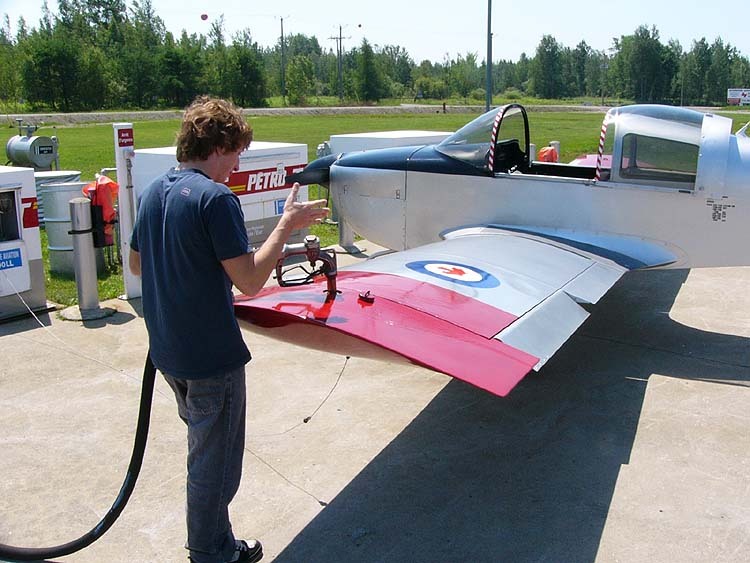 ("AvGas" = an abbreviated way to say "Aviation Gas", or more simply, Aviation fuel. Because, airplanes that use reciprocating engines, AKA your CAR that you usually drive. Airplane engines are (generally) air-cooled, and the FUEL that is specified for any type of reciprocating piston-powered airplane IS highly regulated, for this and many other reasons. Let's not forget that OTHER types of airplanes utilize different fuels. Turbine Fuel (aka "Jet-A1") is basically a form of kerosene. Yeah, JET engines LOVE it....but piston 4-cycle engines?? Not so much...THEY want something (like "gasoline") that atomitizes easily. Avgas is NOT the same as jet fuel (kerosene) which is used by passenger jets, and is responsible for the contrails in the photo above. What prompted Mike Adams to write the piece - did he just find some old research on it and sensationalise or has the issue had exposure recently? Some comments under his scare-piece add some perspective. Gee, my calculations based on the above (31,536 dumped over 9.83 million km's square), like the one below, show 3mg per square kilometer per year in the USA.. The space you're standing in, 1 square meter, gets "showered" with .003 mg of led per year. To put that in perspective one 4.5 inch hair on your head weighs about .7mg. So in 233 years the square meter you occupy is being "pelted" with 1 hair's worth of lead IN TOTAL. So ya I smoke as much pot as the next guy - if we want to be paranoid about being poisoned there are plenty of other red flags much, much huger than aircraft fuel. contrails in the photo are not likely to be from from piston engine aircraft. The further math results in the amount of lead applied per acre being .00753 ounces per acre per year. That's 1/133 of an ounce, or about the weight of two toothpicks in lead/ per acre, per year. That's .0000015 ounces per square yard, or 1/666666 of an ounce per square yard per year in the USA. That's .000075 ounces or 1/13333 of an ounce per square yard of the USA over 50 years. That's about 2 milligrams, or 1/50th of a toothpick in lead weight per square yard every 50 years. Now, I am not an advocate for pollution, or an apologist for any industry. But throwing numbers out and not bringing them down to the ground where it matters does not help. 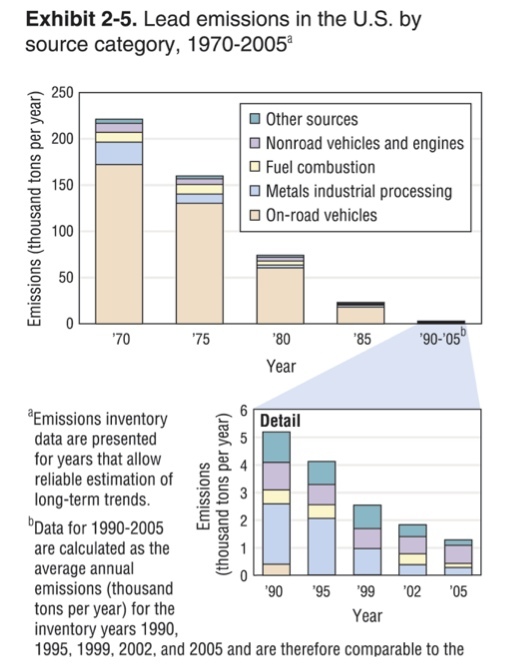 While it would be a helpful thing if technology would find a replacement for lead in all fuels, there are more pressing environmental issues where pollutant emissions are a greater threat to human health than piston aircraft fuel emissions. There are also more pressing lead exposure issues. Even organic produce can have high levels of lead if they are grown on soil that was previously used with lead-based pesticides in the "old-days", or simply soil that has a high natural lead content level. 3mg per square km is even less than .003 per square meter. 1 square km is 1000x1000 meters. So it's 0.00003mg per square meter. You probably get more lead than that in ordinary water or food contamination. A mile away from the runway, and it's not detectable above background levels. This is the headline from a just posted article By Mike Adams. Does it seem odd to anyone that nowhere in the Adams article is the intentional spraying of the skies even mentioned? Does it seem odd that the terms “geoengineering” and “climate engineering” are never brought up? And why wouldn’t you mention all the aluminum and barium showing up in lab tests around the globe, Mike? Doesn’t that matter any more? The article in question mentions “571 tons of lead” put into the atmosphere annually, but what about the 20,000,000 tons of aluminum nano particulates stated as an annual atmospheric spraying goal by the geoengineers? The article above by Mike Adams implies that the trails we see in our skies are simply a matter of very dirty fuel, thats it. This implication is patently false and there is no excuse for this disinformation from one that claims to be an independent researcher and journalist. Jet fuel'is,t even gasoline,JP4 is high octane kerosene. The article above by Mike Adams implies that the trails we see in our skies are simply a matter of very dirty fuel, thats it. This implication is patently false and there is no excuse for this disinformation from one that claims to be an independent researcher and journalist. Dane, the lead isn't there because the fuel is "dirty". Tetraethyl lead (TEL) is added to avgas to increase octane and thereby prevent “knock,” or uncontrolled fuel detonation, which can damage aircraft engines during flight, compromising safety. EHP – Sunset for Leaded Aviation Gasoline? And leaded fuel is probably responsible of <1% of all contrails, which, as mentioned above, come largely from jet engine planes (including turboprops), not piston engined prop planes. That's due to the altitude they fly, nothing to do with fuel. Well actually, Airport Teuge (where I come very often) are planning to replace Leaded fuel with bio fuel (MOGAS) to make it better for the environment. MOGAS is just automobile gasoline refined from petroleum crude oil. Yep - typically aero engines are not designed to run on the particular mix of hydrocarbons in MOtor GASoline, so require approval to do so. IIRC 20 years ago here in NZ if you ran an engine on MoGas you then couldn't then run it on AvGas without a strip/rebuild.